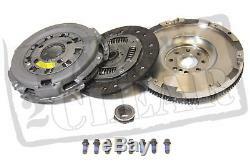 VW GOLF IV 1.9 TDI VOLANT EMBRAYAGE KIT 90 100 110 BHP CV SMF 1.9TDI 1997 - 2004. Flambant neuf SOLIDE Mass volant and EMBRAYAGE Kit This Kit Will Fit: VW Golf MK4 08/1997 - 05/2004 Engine Codes: AGR, ALH, ATD, AXR, AHF, ASV 1.9 TDi Fits 90, 100 and 110 BHP Models This Kit Contains. At Parts2Clear we pride ourselves on our high level of customer service. Should you have any issues or concerns with your order please send us a message. The manufacturers report will be final and we shall have no further liability to you. Under no circumstances will we accept liability for consequential loss or damage or pay for any repairs or alterations without prior authorisation. We will have no liability. All warranties provided are non-transferable and apply only for the original customer. If you are exercising your'right to reject', you must notify us prior to fitment of the goods and within the 30 day period. Once fitted we reserve the right to investigate your claim. Under no circumstances will we accept liability to you in respect of costs incurred such as: (but not limited to) loss of earnings, travel expenses, recovery costs, damages etc. L'item "VW GOLF IV 1.9 TDI VOLANT EMBRAYAGE KIT 90 100 110 BHP CV SMF 1.9TDI 1997 2004" est en vente depuis le mardi 1 août 2017. Il est dans la catégorie "Véhicules\ pièces, accessoires\Auto\ pièces détachées\Systèmes de transmission\Kits d'embrayage complets". Le vendeur est "parts2clear" et est localisé à/en Cheshire. Cet article peut être livré partout dans le monde.